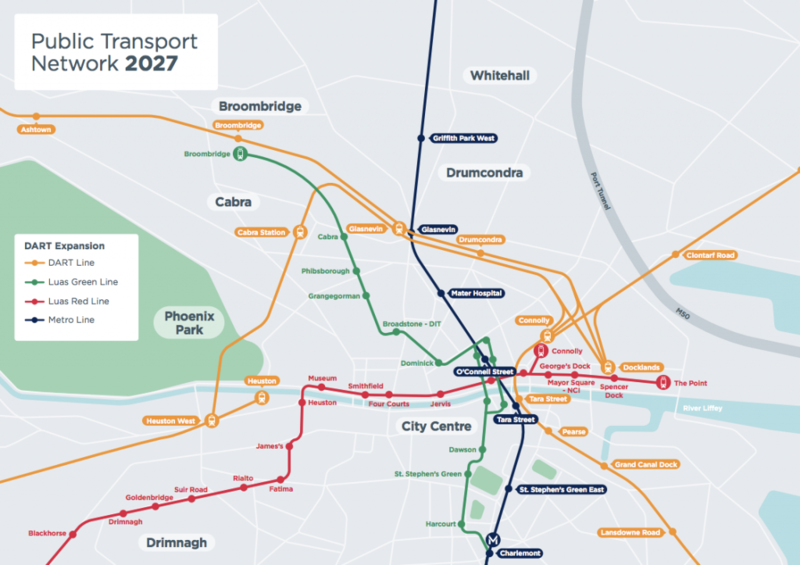 The DART Expansion Programme is a series of projects that will create a full metropolitan area DART network for Dublin with all of the lines linked and connected. The initial sequencing of investment will focus on delivery of non-underground tunnel elements of the programme using the recently opened rail link and existing connector tunnel under the Phoenix Park. This includes buying additional fleet for the DART network and measures such as re-signalling, junction and station changes to provide expanded services. The next step will be to provide fast, high-frequency electrified services to Drogheda on the Northern Line, Celbridge/Hazelhatch on the Kildare Line, Maynooth and M3 Parkway on the Maynooth/Sligo Line, while continuing to provide DART services on the South-Eastern Line as far south as Greystones. It will also include new stations to provide interchange with bus, LUAS and Metro networks.